-FOB Price: 0.6-1.2USD -Min.Order Quantity: 300 Pieces/Pieces Customer can mix many designs in 1 order -Capacity: 45,000 Pieces/Month -Port: Hanoi/Hochiminh -Payment Terms: L/C, T/T, Western Union, MoneyGram, Paypal -Transport Method: UPS, DHL, TNT, SHIP *Quick Details -Material: Good quality -Product Type: Card -Card Type: Greeting Card/Birthday Card/Congratulation Card/Funny Card/Wedding Card/Love Card/Xmas Card/christmas card/Thank you Card/Valentine Card -Brand name: 3dcard.vn -Style: Artificial -Use: Souvenir/Gift -Theme: Birthday -Regional Feature: Viet Nam -Place of Origin: Hanoi, Vietnam -Size: 150 x 150mm -Color: Options -Packing: 01 plastic bag fit size and 01 white envelope or 01 cream envelope for a card (01 big plastic bag for 10 cards), standard carton box outside. All free If you have any question, please note me sale(at)3dcard(dot)vn. 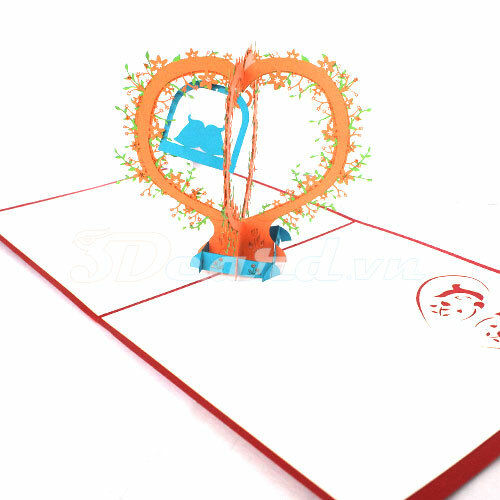 Bird ring 3d card pop up card greeting card love card by 3dcard.vn at Pakbiz.com a premier Business to Business marketplace and largest online business directory. Find Bird ring 3d card pop up card greeting card love card from Vietnam complete basis & contact information, business offers, availability & related Arts & Crafts products. This page gives you information about the authentic sellers of this product. It allows buyers and sellers communication directly. It can also facilitate the buyers to purchase the product in reasonable prices.